VANCOUVER, BC – November 12, 2018 — Mirasol Resources Ltd (TSX-V: MRZ) (OTCPK: MRZLF) (the “Company” or “Mirasol”) is pleased to report that Newcrest International Pty Limited, a wholly owned subsidiary of Newcrest Mining Limited (ASX: NCM), has exercised its option to enter the Farm-in stage of the Altazor Agreement, triggering a US$500,000 payment to Mirasol. Newcrest has presented a budget of US$3.3 million for this season’s exploration program, including a maiden drill program, subject to obtaining applicable permits and permissions. 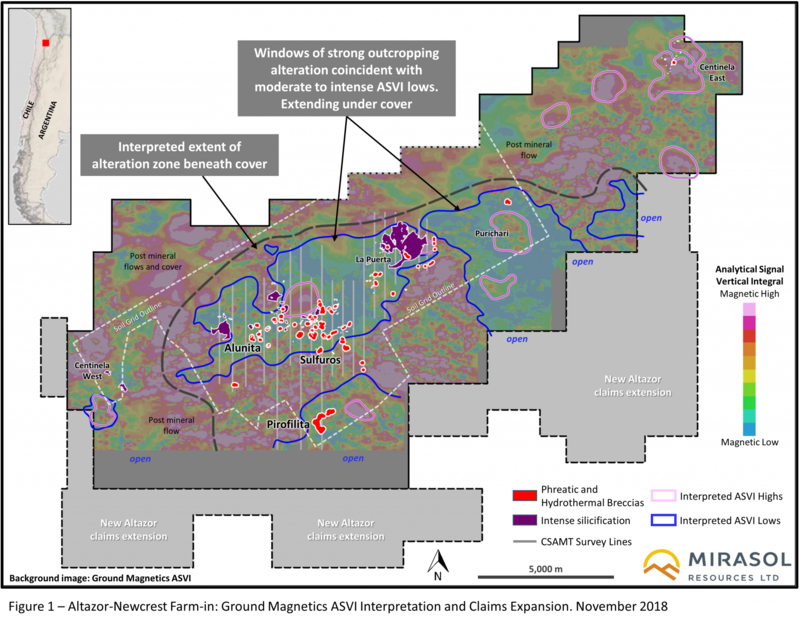 Option to Farm-in Agreement: The initial 12-month Option stage of the Altazor Agreement has been completed with NCM incurring exploration expenditures in excess of US$1.5 million. NCM has made a US$500,000 option payment to Mirasol, exercising the Farm-in stage of the agreement, where it now has 4 years to spend an additional US$8.5 million (total US$10 million) to earn 51% of the project (see news release November 21, 2017). NCM will be operator, managing all exploration activities at the project, allowing Mirasol’s exploration teams to focus on new opportunities. 2018/19 Planned Program: NCM has presented a budget for this year’s southern hemisphere summer exploration program at Altazor totaling approximately US$3.3 million, subject to obtaining permits and permissions. The budget includes allocations for a planned maiden drill program, totaling up to 4,000 m to test a series of compelling drill targets associated with multiple, large, very resistive (7500 to >30,000 Ohm-m) Controlled Source Audio-Magnetotellurics (CSAMT) geophysics anomalies at the Alunita, Sulfuros and Pirofilita prospects identified by last year’s exploration. The budget also includes allocations to continue the surface exploration of the large Altazor alteration system including infill and survey extensions of the CSAMT geophysics, geological mapping, and soil and rock chip sampling to test new areas of the Altazor alteration system. This seasons surface exploration is anticipated to start late in the fourth quarter of 2018. Environmental Studies, Drill permit and Community Relations: NCM has commenced drill and road access permitting to the prospects, environmental studies and the community consultation process for the drill program. Drilling is anticipated to commence in the second quarter of 2019, once permitting has been completed. Claims extension: 2017/18 exploration results identified potential covered extensions of the Altazor alteration system. NCM and Mirasol have recently staked approximately 10,000 ha of new claims expanding the project by approximately 30% to a total of 33, 230 ha. NCM and Mirasol are targeting large-scale bulk mineable High Sulfidation Epithermal (HSE) Au+Ag deposits at Altazor, of the style recently discovered elsewhere in the Mio-Pliocene Mineral Belt of Chile by Gold Fields at Salares Norte (currently under feasibility study)1 and by Barrick Gold at the Alturas2 project. Altazor has favorable logistics, situated just 20 km south of 345 kV powerlines that follow International Highway Route 23, a paved road connecting northern Chile and Argentina, a potentially significant logistical advantage if a discovery were to be made at the project. In common with other Mio-Pliocene mines and projects in Chile and Argentina, Altazor is located at high altitudes of between 4,000 and 5,200 m; however, Altazor has “drive up access” via an open valley and a network of easily passable gravel tracks to the east side of the project. The Altazor Project is centered on a district-scale zoned argillic to advanced argillic alteration system hosted by a dacitic to andesitic volcanic complex, that is crosscut by multiphase, strongly altered phreatic and hydrothermal breccia systems. A large proportion of the Altazor project is capped by laterally extensive, but relatively thin, unaltered post mineral volcanics, that conceal the full dimensions of the alteration and breccia system. All results from last season’s exploration program have been received. This includes long lead time “Corescan”3 alteration analysis of soils and radiometric age dates as well as results from a 1,035 line-km ground magnetic survey, geological mapping and rock chip sampling over an area of 128 sq. km, a 2,030 sample, low detection limit soil grid covering 85.6 sq. km, and a 66.9 line-km CSAMT resistivity geophysical survey. Integrated analysis of the combined data sets shows Altazor to be a district-scale, zoned alteration system, preserved at a level that could conceal HSE gold deposits beneath a “barren” steam heated cap rocks and post mineral cover, as has been the case at recent multimillion ounce discoveries elsewhere in the Mio-Pliocene mineral belt in Chile. 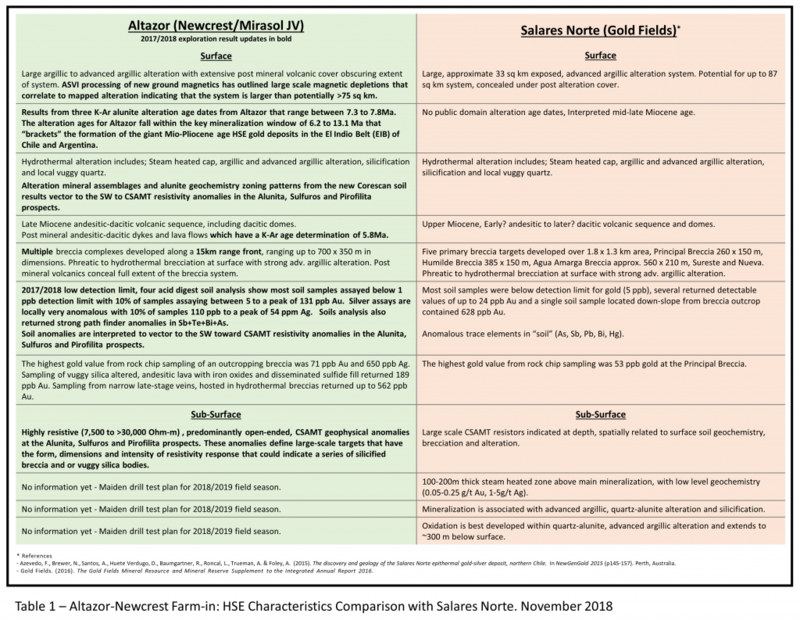 NCM and Mirasol have received results from three K-Ar alunite alteration age dates from Altazor that range between 7.3 to 7.8Ma. An additional K-Ar age determination on biotite for the post mineral volcanics has returned a younger age of 5.8Ma. The alteration ages for Altazor fall within the key mineralization window of 6.2 to 13.1 Ma that “brackets” the formation of the giant Mio-Pliocene age HSE gold deposits in the El Indio Belt (EIB) of Chile and Argentina. Bracketing of the Altazor alteration age within the EIB mineralization ages confirms the Altazor system formed during this key period for gold deposit formation and as such, may have the potential of being a productive precious metal system. Alteration and breccias outcrop intermittently along a 15 km long NE-oriented range front that is interpreted as a series of large fault scarps. The 207 sq km ground magnetic survey completed over the project, shows a series of large magnetic depletion zones, correlating with the mapped areas of alteration, that are separated by the magnetically distinct post alteration volcanics (Figure 1). It is interpreted that the post alteration volcanics partially “mask” the magnetic depletion signature of the underlying alteration, suggesting the Altazor system may cover a much larger area and be open to the south into the new claims recently staked by the NCM and Mirasol. Au+Ag mineralization in HSE deposits is invariably associated with bodies of intense silicification and brecciation (for further information about HSE gold deposits click here). CSAMT geophysics has been successfully used in recent significant HSE gold discoveries as an exploration methodology to target concealed high intensity resistivity anomalies, that subsequent drill testing confirmed to be vuggy silica and silicified breccia bodies hosting gold mineralization at these projects. 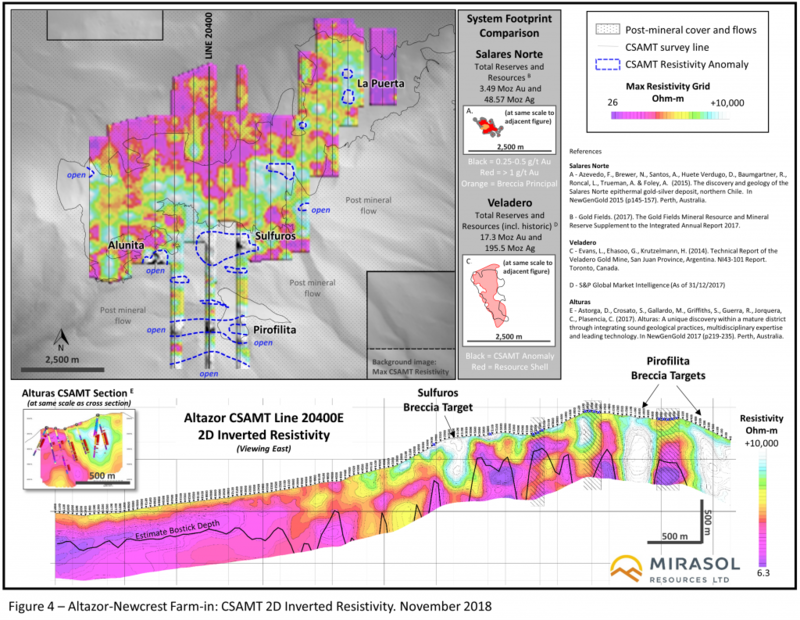 At Altazor, in the central part of the alteration system, 66.9 line-km of CSAMT was surveyed on 400 and 800 m line spacing and delineated a series of concealed and predominantly open ended, intense resistivity highs (7,500 to >30,000 Ohm-m) anomalies at the Alunita, Sulfuros and Pirofilita prospects. Geochemistry from 2,030 soil samples collected on an 85.6 sq. km soil grid using low, ppb detection limit, four acid digest, multielement analysis show subtle element patterns in “geochemically barren” steam heated and advanced argillic altered cap rock (Figure 2). 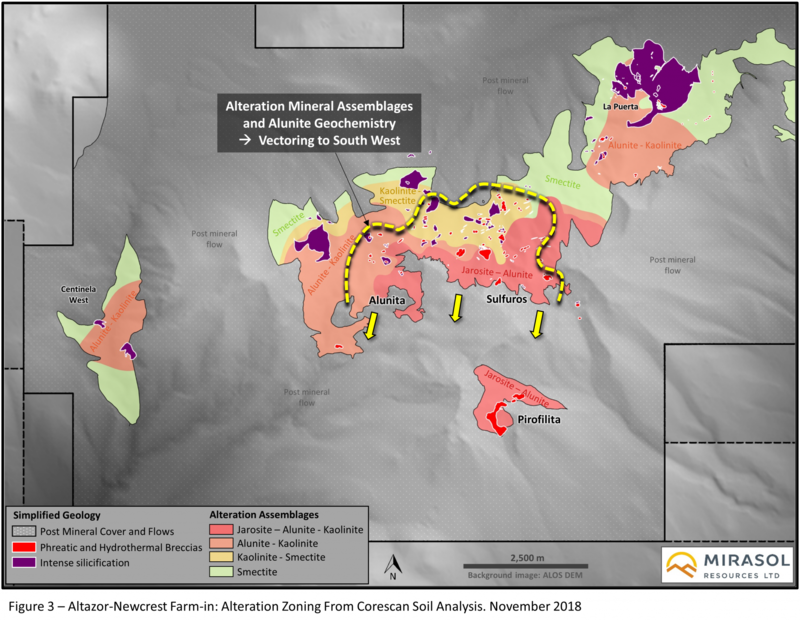 Integrated analysis of this data has mapped low, ppb level Au (peak assay 131 ppb) with strongly anomalous Ag+Sb+Te+As that vector toward the SW into an area of concealed high intensity CSAMT resistivity anomalies at the Alunita and Sulfuros prospects. The Pirofilita prospect is characterized by soils that are strongly anomalous in Ag (local peak values of up to 22.3 and 54 ppm) and Sb, with low level Au, spatially coincident with outcropping intensely silicified breccias and concealed, highly resistive CSAMT anomalies. Systematic analysis of all soil samples with Corescan provided a powerful additional dataset that was used to map district-scale zonation in alteration mineral assemblages and was combined with the soil geochemical analysis to map spatial variation in indicator element ratios in alunite chemistry (Alunite Geochemical Vectors). Alteration mineral assemblages and alunite geochemistry that emerged from this analysis are important new methodologies for exploring in large high-level alteration systems to target covered mineralization bodies. 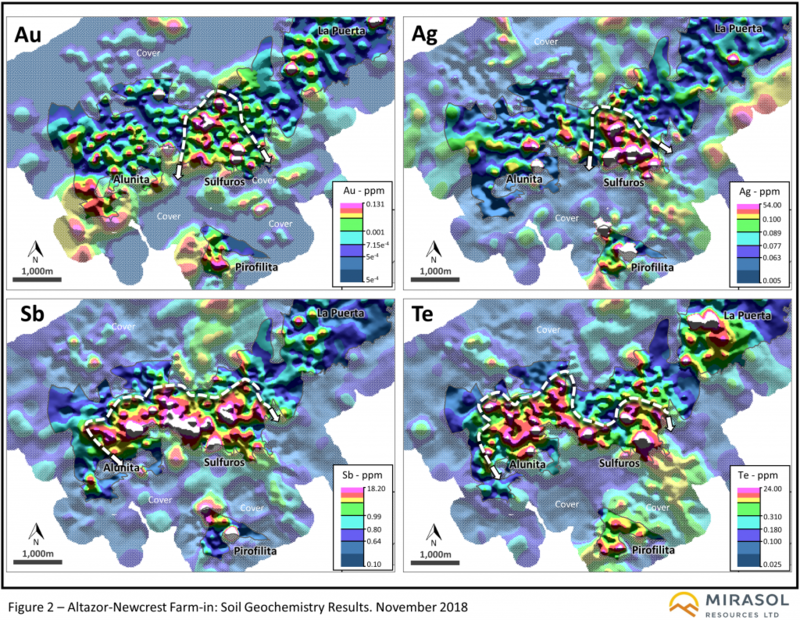 At Altazor these results vector to the SW, corroborating the soil geochemistry vectors and further highlighting the concealed CSAMT resistivity anomalies as priority drill targets (Figure 3). The 2017/18 Altazor exploration results highlight the large areal extent of the alteration system at the project that will require several seasons to complete a first pass evaluation. The integrated leading-edge technologies applied during the first season’s exploration, have identified multiple compelling large-scale drill targets in three principal prospects that have alteration, geochemical and geophysical characteristics in common with the predrill target signatures of Salares Norte (Table 1) and other recent HSE gold discoveries. Analysis of the Altazor data sets outlines alteration mineral composition variation and low detection limit soil geochemistry anomalies, highlighting predictive patterns that vector towards a series of covered and predominantly open-ended, very resistive (7,500 to >30,000 Ohm-m) CSAMT geophysical anomalies at the Alunita, Sulfuros and Pirofilita prospects (Figure 4). These anomalies define large-scale targets that have the form, dimensions and intensity of resistivity response that could indicate a series of silicified breccia and or vuggy silica bodies. The association of Altazor mineral chemistry and soil geochemistry vectors, and CSAMT resistivity anomalies define a series of high priority conceptual targets for large scale HSE gold mineralization4, that will be the focus of the planned 2018/2019 maiden drill campaign. Mirasol will update its shareholders of progress as exploration advances at the Altazor project. 1 Gold Fields. (2017). Integrated Annual Report 2017. 2 Barrick Gold Corporation. (2017). Annual Report 2017. 3 Corescan’s Hyperspectral Imager integrates high resolution reflectance spectroscopy (0.5mm), visual imagery (0.05mm) to map mineralogy and mineral chemistry. 4 Azevedo, F., Brewer, N., Santos, A., Huete Verdugo, D., Baumgartner, R., Roncal, L., Trueman, A. & Foley, A. (2015). The discovery and geology of the Salares Norte epithermal gold-silver deposit, northern Chile. In NewGenGold 2015 (p145-157). Perth, Australia. Mirasol applies industry standard exploration sampling methodologies and techniques. All geochemical soil, stream, rock and drill samples are collected under the supervision of the company’s geologists in accordance with industry practice. Geochemical assays are obtained and reported under a quality assurance and quality control (QA/QC) program. Samples are dispatched to an ISO 9001:2008 accredited laboratory in Chile for analysis. Assay results from surface rock, channel, trench, and drill core samples may be higher, lower or similar to results obtained from surface samples due to surficial oxidation and enrichment processes or due to natural geological grade variations in the primary mineralization.